September is almost over and we think the Beading Divas may have had a record month of fund-raising for Arizona Greyhound Rescue but we won’t divulge the amount until October. In October we start with another local animal charity — stay tuned. “Well, just had to tell you. . .my bracelet arrived from Lizzie and I was blown away at how lovely it is……It arrived an hour ago and I just got off her Etsy site after ordering 3 more….great bracelets, wonderful cause, she must be a lovely lady……Hope I can part with the bracelets, they’re supposed to be gifts, at least a couple of them are….. The Beading Divas enjoy spreading happiness to the animal rescue groups we help and the people who buy and cherish our bracelets. (Photo by Michelle Caillet) – The photo is of Opa & Riley at the Greyt Escape greyhound resort. Opa & Riley live there and make all the vacationing greyhounds feel right at home. 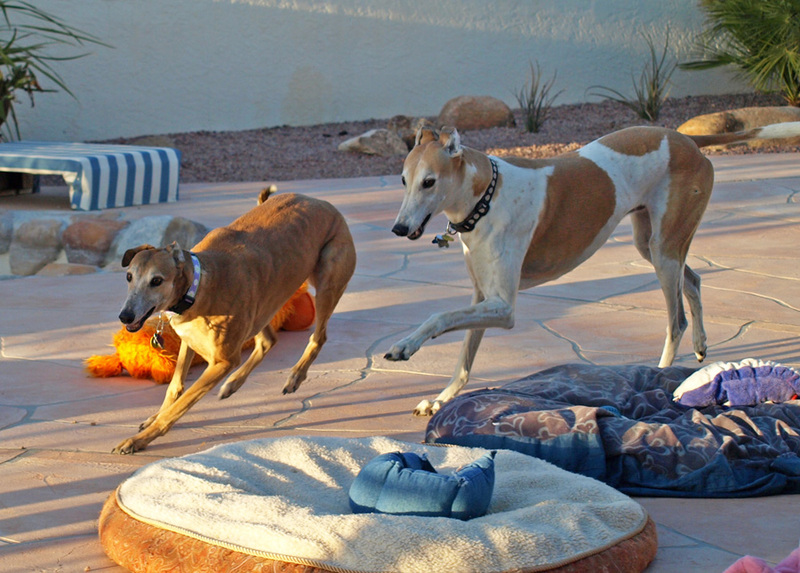 Riley and Opa were adopted from AZ Greyhound Rescue. I received mine early in September and I love my bracelet. Like everyone says – they are exquisite. I love mine since my friend Noni made it. Please find in your heart to purchase a bracelet if you have not already. You won’t be sorry. They are just beautiful beyond words.